Arriving at a gate, a warmly-dressed woman with a clipboard greets cars, then directs them to park. The red-lit parking lot fills with the busy, but quiet, preparations of crane watchers. Murmurs from sandhill cranes already echo from the river sandbars where they roost. 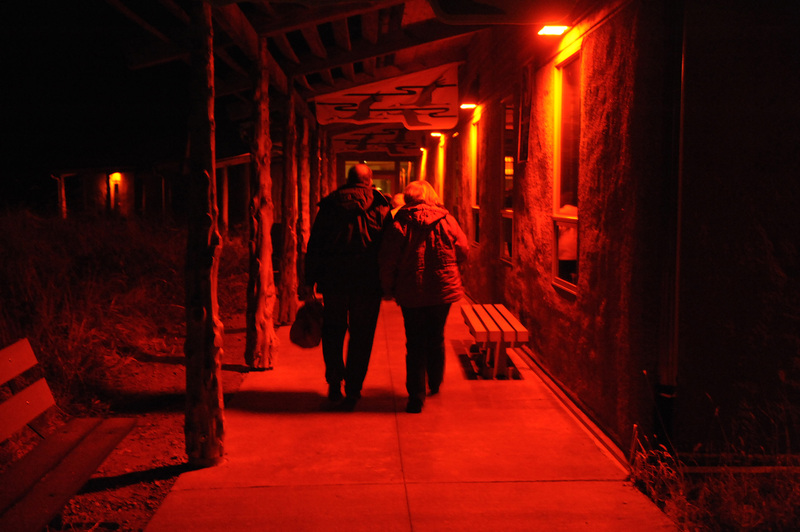 Pulling on jackets and knit caps, collecting binoculars and cameras, people funnel through the doors of the visitor center at Audubon’s Rowe Sanctuary. Once inside, crane tourists receive a brief video orientation on the state of the Platte River ecosystem: how the historic prairie river was a mile wide and an inch deep, how spring floods and ice jams used to scour the river of trees and woody vegetation, reshaping the channel and creating the wide, braided sandbars sandhill cranes have returned to for centuries. And how our thirst for water: for irrigation, cities, recreation, and the resulting series of upstream dams and diversions have reduced today’s Platte River flows to a fraction of their original volume, leading to overgrowth in the river channel and compromised habitat for these birds and many other species, including several considered critically endangered. Education has always been an important tool in conservation, said Bill Taddicken, director of Rowe Sanctuary. “That’s kind of Audubon’s niche; connecting people with nature and really getting people to experience things firsthand. Because if people don’t know about something or learn to love it, they won’t care about it and therefore won’t take care of it,” Taddicken said. Each spring, most of the North American population of sandhill cranes migrates through the Central Platte Valley, spending three to four weeks along the river and nearby wetland habitat, feeding, resting and socializing. And each spring, thousands of tourists—sometimes fondly called “craniacs”—perform their own migration, traveling from near and far to see them. Audubon’s Rowe Sanctuary gets upwards of 20,000 visitors through its grounds during March and April. Roughly 6,000 of those folks will also spend an evening or morning watching the cranes up close: through a viewing blind along the riverbank. That’s where this early morning group heads after the video ends. Volunteer guides take groups back into the morning darkness, walking paths toward the river where they’ll wait quietly to watch the sun, and the cranes, rise. The blinds, small, camouflaged buildings perched on the bank have windows facing out onto the river. Islands sandbars and the indigo current are barely visible in the early morning light. The sun arrives slowly and as it does, visitors realize those islands aren’t sand but thousands of cranes, crowded so closely together they appear as one body. With the light comes a building cacophony, a rising and falling chorus of calls unlike anything else. After the sun rises sufficiently, the birds typically leave the river in waves, headed back to nearby fields where they’ll spend the day resting and eating, building critical fat stores for their journey to the far north. Star-struck tourists return to the visitor center, their excited, delighted chatter almost mimicking the cranes. “It’s a joy to watch people connect with the cranes when they least expect it,” Taddicken said. And through the 18 years he’s worked at Rowe, he never tires of it. “It happens everyday. You visit with people in the center and you can just feel the vibrations coming off of them, they’re so excited about what they saw and what they experienced,” Taddicken said. 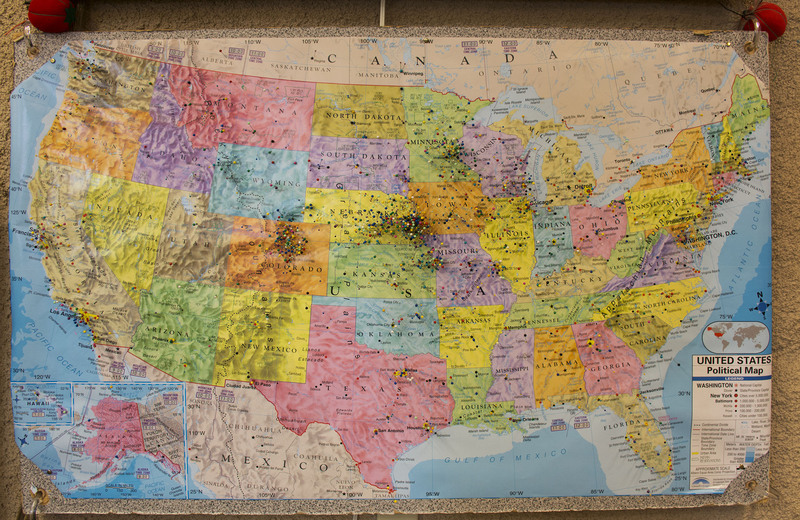 People come from all 50 states and as many countries to see the sandhill crane migration. Along with visitors, volunteers return year after year to guide tours, provide information and conduct work along the river corridor. Rob Ahlschwede and his wife Susan have been volunteering at Rowe for 13 years. Ahlschwede said he grew up in eastern Nebraska, unaware of the crane migration. Though he now lives in Olympia, Wash., he hasn’t missed a spring trip to the Platte since his first “mesmerizing” trip in 1978. A retired teacher, Ahlschwede said he enjoys the education aspect to volunteering, helping people learn more about the cranes and their habitat. 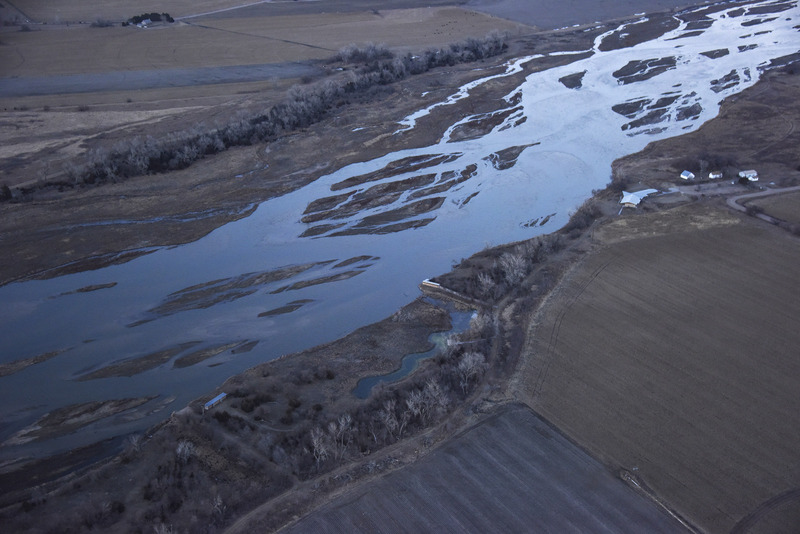 Though it exists today as a compromised ecosystem, the Platte River is also very fortunate, Taddicken said. “Because this quiet, unassuming prairie river has a voice that comes back to it every spring. A voice that talks very loudly. And Audubon’s been able to share that voice with people. 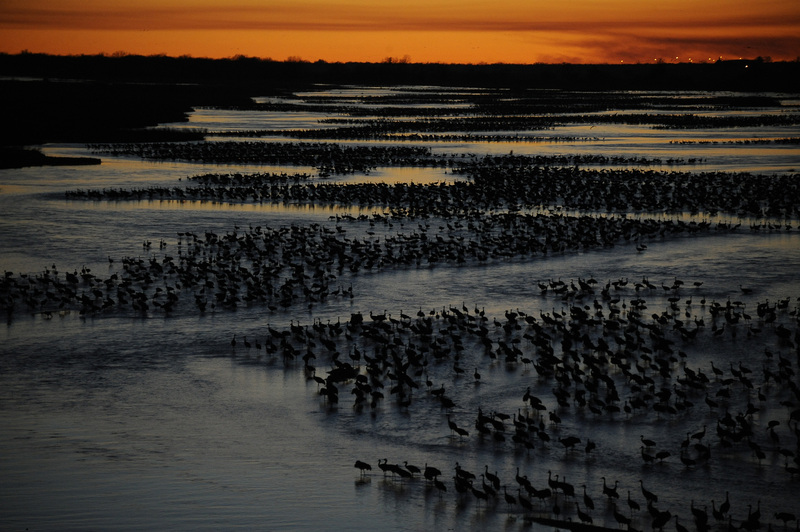 Those cranes come back and speak to the people about this special place and the amazing Platte River,” Taddicken said. 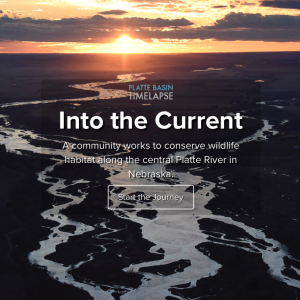 As a working river and landscape, the Platte will be further challenged by increasing water demands and a changing climate. With 90 percent of wet meadows and channel habitat already gone, Taddicken said, this migration won’t continue without help. “It’s a constant effort to maintain what we have and try to improve and expand the habitat for these birds,” Taddicken said. That’s the main function of Audubon and other conservation groups along the central Platte River, who also host crane tourists in the spring. 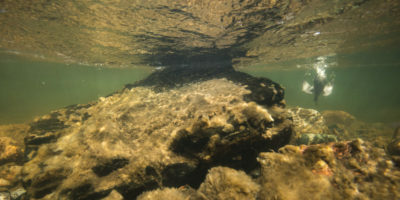 For the last few decades, various federal, state and private conservation partners have worked year-round to maintain river channel and wetland habitat for these birds and other species. “We use the sandhill crane to bring everybody in so we can do the work on the river that helps the whooping crane and piping plover and least tern who are all on the endangered list,” Ahlschwede said. Funds from crane tourism activities and donations help support the work at Rowe Sanctuary. And new people visit every year. Dave Rowe (no relation to Audubon) made his second trip from his home in Omaha to see the cranes this April and brought his dad with him. They arrived in the afternoon and spent the whole night out on the river in a photography blind. “You’re right on the river, really close to the cranes. You get to see them come in, jump and dance and flay out their wings, and then you get to sleep with them talking all night,” Rowe said. It’s a spectacle as diverse as snowflakes, Taddicken said. “So we have to find cooperative, sustainable solutions for all of our issues,” he said, to keep that spectacle, and ecosystem, alive for generations into the future.